Bus Routes Provide "Indispensable Service to Passengers"
High Road's Bus Car Park "Worse Than Ever"
Turnham Green Terrace camera branded "oppressive"
As the 'bus car park' debate continues, General Manager of Stamford Bus Garage has responded to some residents' concerns about the siting of the shift change over. 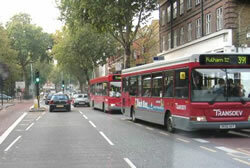 He states "London United operates four services, 27, 267, 391 and H91 along this stretch of Chiswick High Road, and there are two further services, 190 and 237 operated by Metroline. 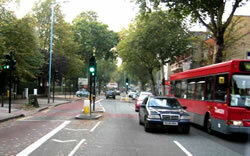 These six routes provide an indispensable service to millions of passengers annually and without such regular services Chiswick High Road would probably grind to a halt through the additional traffic generated. "The main aspect of any bus service seeking to attract car users is reliability and this depends greatly on a robust schedule being in place. The two services which both operate from Stamford Brook and have drivers changing over near the garage for their legally required meal break, the 27 and 391, provide a better service to the public as a result. Clearly it is in no-one’s interests, including our own, to swap the efficiency from changeovers for unnecessary traffic delays at that location. "The Operations Manager at Stamford Brook, Mrs Munns, and I have reinvigorated the message to all of the drivers on these routes about the precise location where changeovers are to take place. The Service Controllers based at the Control point at the front of the garage are also providing regular patrols of the area." Commenting on the photographs that were sent to him by one resident, Adrian Hill said "Unfortunately it has not been possible to obtain the date and time information from the photographs supplied. If this could be provided, we will be able to take action against the individuals concerned." However, one resident remains unconvinced believing that the bus lane is being used as a "cost cutting measure." He told ChiswickW4.com "The Chiswick high road improved by TFL so all traffic follow and not for the bus company to use in this way and cause bottle necks and black spots. With the entrance to the bus garage and with three sets of traffic lights that operate with in such confined part of the High Road, it was never meant to be used in the way the bus company and its staff are currently using it." Hounslow Council's Chris Calvi-Freeman said "I am quite sure there have been instances of bus drivers causing unnecessary delays to through traffic by making the changeovers in the wrong place, or by not presenting themselves in time to move the bus on promptly. Adrian Hill has assured the Borough that he is on the case, and meanwhile I am considering whether we can make some minor adjustments to the eastbound bus stop to improve traffic flows. The buses provide benefits to thousands of people and, unfortunately, this involves driver changeovers, which no matter how smooth will cause some disruption to through traffic on occasions. "In an ideal world, or course, the bus depot would not be on the busiest stretch of the High Road, which has to accommodate traffic between Shepherd's Bush and the Chiswick Roundabout in addition to Hammersmith-Chiswick-Brentford flows. Some delays along this stretch are virtually unavoidable."